Car Amps Online Parts Finder. Enter the year, make, & model to find parts for your car. Car Stereo With Complete Installation Kit. 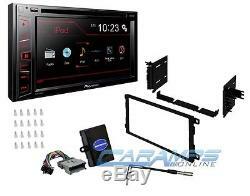 Pioneer 6.1 Touchscreen DVD Double DIN Car Stereo With AUX & USB Input & Remote. When replacing your factory radio with an after-market car stereo, a dash kit is a must for a quick and professional looking installation. It will securely mount your new stereo in the dash and will result in a professional gapless finish between your radio and the dash. When replacing your factory radio with an after-market car stereo, a interface is required for a number of vehicles that have modern technology. This unit has everything needed to make the change. This interface eliminates cutting your OE radio plug helping to maintain your cars value. After connecting it, your install is simple as the wires will color-match and easily connect to the after-market stereo. Without this interface you would not be able to replace your stock radio with a aftermarket stereo. Don't be left without a radio when you install your new stereo. When replacing your factory radio with an after-market car stereo, many cars need an adapter that will plug into factory antenna cable. This adapter will make the installation very easy. It works on the vehicles listed and has a standard Motorola male output so it will work with any regular aftermarket receiver. We have put this kit together with all of the parts needed for your installation. If you are doing the installation yourself the only thing you will need are common tools to take your dash apart and a good pair of crimpers to crimp the wire harnesses together with the included crimp caps. We do recommend that on some cars if you are installing this yourself that you use a set of dash removal tools that are made to remove your dash without scratching or damaging it. Includes everything needed for installation. Wire harness connects the aftermarket stereo harness to the vehicles factory harness. Designed specifically to fit the compatible vehicles. Wire harness will plug into the factory without cutting any wires. Standard color coded wires provide a consistent and simplified installation. Made from OEM quality materials. Includes chime interface to keep safety & warning chimes. Sends vehicle computer healthy status. Retains RAP feature if equipped. Works with standard Bose factory sound systems. Does not retain factory steering wheel controls. MIXTRAX: MIXTRAX app Illumination Effects. Peak: 50 watts x 4 channels. RMS: 14 watts x 4 channels. Wireless remote control not included. Made for and works with iPod and iPhone. Enjoy Advanced App Mode, you'll need Pioneer's iPod cable. Play Back and Audio Features. Plays audio/video content from CDs, DVDs, and USB memory devices. 5-band graphic equalizer with 7 preset EQ curves. Digital time alignment Inputs and Outputs. 4-channel preamp outputs (2-volt front, rear/subwoofer). Pioneer AVH-X170DVD Car Stereo Receiver. Radio replacement interface with chime box. 2003 - 2006 Escalade ESV. 2003 - 2006 Escalade EXT. 2004 Malibu Classic (Does not fit new body styles). 2000 - 2005 Monte Carlo. 2007 Silverado Classic (Does not fit new body styles). 2003 - 2007 H2 SUT. 2003 - 2006 Sierra Denali. 2007 Sierra Classic (Does not fit new body styles). 2003 - 2006 Yukon XL. It will work if your vehicle came with OnStar but will not retain it. Our warehouse is full of Accessories, Amps, In Dash Receivers, Speakers, and Sub. The item should be unopened in the same condition they were received. We strive for 5 star feedback. If you feel we did not meet this please send us a message so that we can work with you to resolve the issue. The item "PIONEER 6.1 TOUCHSCREEN CAR STEREO RADIO RECEIVER W DASH KIT INTERFACE & ANTENNA" is in sale since Wednesday, February 19, 2014. This item is in the category "eBay Motors\Parts & Accessories\Car & Truck Parts\Interior\Dash Parts".